We’re Right Next Door to SeaTac Airport. 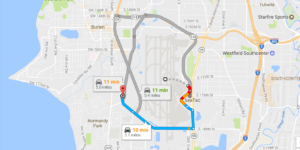 We don’t just say we’re the closest Marijuana Store to SeaTac Airport to be cool, we really are the absolute closest Marijuana Store to SeaTac Airport. We’re basically right next door. We are the SeaTac Marijuana Stop. If you are looking for a quick, wonderful cannabis experience while visiting Seattle and/or waiting out a long layover at a local SeaTac hotel, come down and visit us at Kush21 and we’ll be sure to make your visit worthwhile! Marijuana is great for moments when you just want to hang out and relax, and the quick 10 minute drive around the airport is completely worthwhile! Our menu is sure to have something to peak your interests. We’re looking forward to meeting you and educating you about our wonderful state, marijuana, local spots to eat and much much more! So what are you waiting for? Come down to Burien and visit us today! Make sure your layover in the SeaTac area is alot more entertaining and relaxing than you expected. Our store is located right in the crossroads of SeaTac, Normandy Park, Burien & to top if off we’re less then 10 minutes from Kent, White Center, Seattle, West Seattle and some our customers come from as far as Olympia! There is plenty to do in the local area, and a little bit of marijuana is sure to help you become adventurous! As a side note; If you are looking for a Cannabis Tour Guide, contact us and we will be sure to accommodate you. Our goal is to help provide you with the best legal marijuana experience possible. Thats #Kush21 for you. Thats SeaTac Marijuana.